ok first of all OMG you have a BURBERRY CAT, TOO?! j/k, but he does have the right colors. i can imagine his little red tongue. 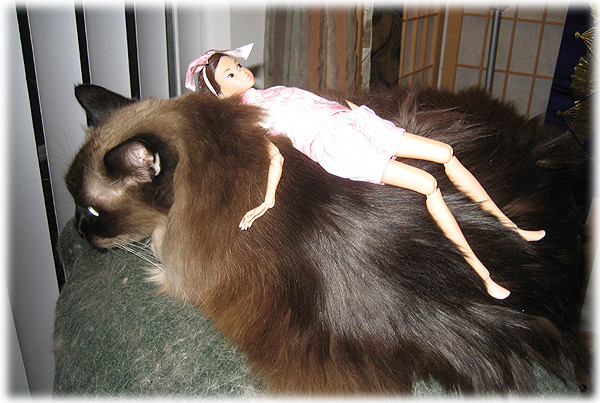 i love how gently your daughter and your cat treat the dolls. May's expression looks to me like a resigned, "Oh, well, if you must...."
She does look kinda resigned, doesn't she. Bucky the Burberry cat! That really is cute; I'd never thought of it that way. He's actually a 5 month old kitten. May and Karen pose with Emily in her pram; all of them decked out in fashionable Burberry! OMG I love the Burberry-ness! And you have a very sweet Romeo there. Wonder how he's gonna react when he learns May has to go after some time? Yeah, I really have that Burberry thing going, eh! This topic is getting sweet and sweeter. Love to read you guys conversation here! So funny and cute!!! Thank you for sharing Tammy! that one with the cat lick could totally go on the "cute overload" website. Bucky, the Burberry cat, sure knows how to give a warm hospitality to its guest with a deep passionate French lick (kiss)!! Sweet!! i know, he's totally CLEANING the doll, right? at least that is what OUR cat Rita Lee says. Thank you everyone for the further lovely comments on my family with May. 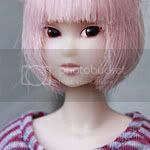 I have been a little busy this week/end, so haven't had a chance to take more photos. 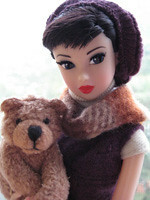 Also, I've ordered May a little outfit from Hong Kong, so I am waiting for that to arrive. So, hopefully I will have some more photos to post within the week. I've been kinda busy, so haven't had a chance to do much with May. May got a new set of pajamas from Hong Kong and decided to visit with some more of my cats before turning in for the night. 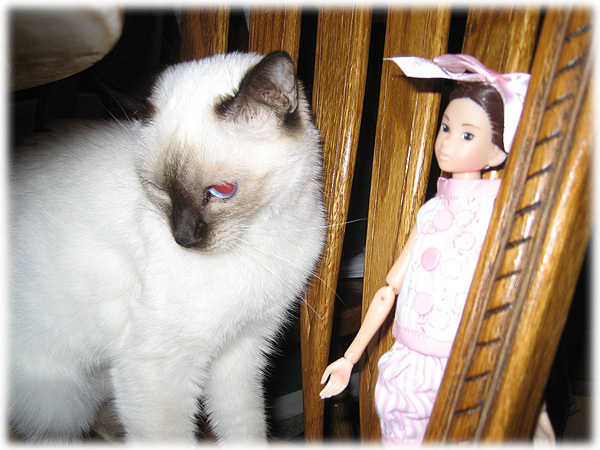 May saying hi to shy little Pixie. Trying out Mochi's fluffiness as a potential bed. And finally settling for a cuddle with super-genius Kimchi. May will be going home this week to Monterey and then off to Europe for her next adventure! Awww!! She looks a weeee bit anxious in that last photo, though. LOL! 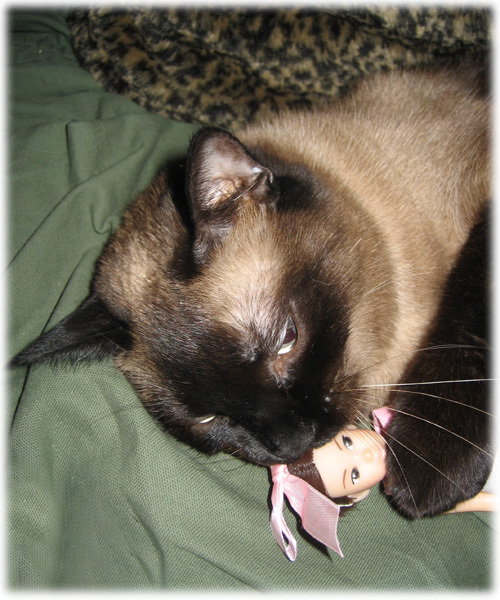 there's just something about pictures of cats with dolls, i never get tired of seeing that.